Fact #1: I’m obsessed with storage. I think no matter how big our house is or how many closets it has, it will always feel like there’s never enough storage. Fact #2: I hate staring at the back of our couch when I’m in the kitchen. It’s boring. It’s flat. Nothing about it excites me. I’ve played with the idea of adding a console table behind the couch/in the kitchen, but we already have one behind our loveseat in our living room and I really didn’t see a need for two. What I really wanted was lots of hidden storage, bonus points for drawers, and no baskets (since we already have 6 at the end of our island). At the top of my wish list, was a piece of furniture that was long and narrow. I wanted to make sure it was wide enough to fill up most of the length of the couch, but narrow enough that it didn’t take up all the space in our eat-in kitchen with no room leftover to get around our table. I’ve been looking for this perfect piece for years. The measurements for IKEA’s TARVA 6-drawer chest were almost exactly what I’d been looking for. 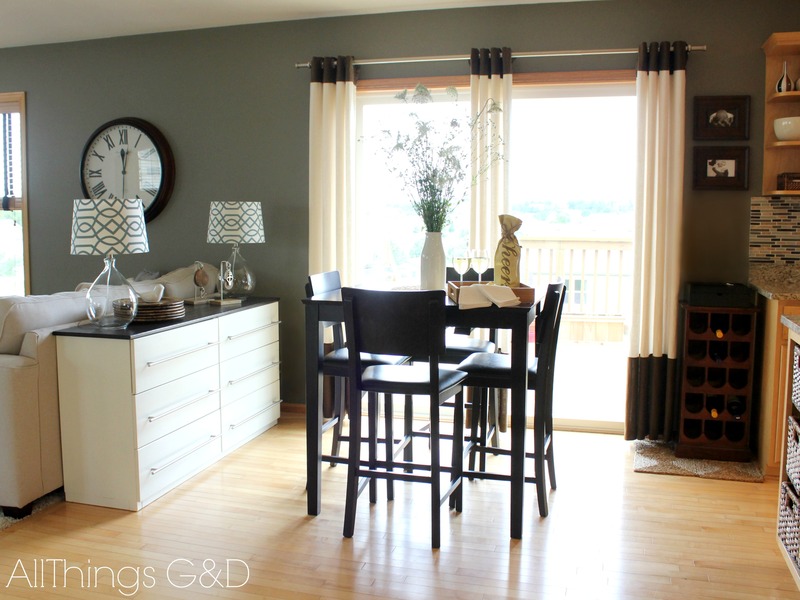 At 61″ wide it was long enough to anchor the back of the couch, and at 15″ deep it was a few precious inches shallower than any other sideboard or buffet I had seen. The only measurement that didn’t quite work was the height – a problem I easily took care of by having G chop off the legs! An IKEA Tarva 6-drawer chest, turned kitchen sideboard – a perfect fit up against the back of our couch! Most people these days think of that distressed, crackled furniture finish when you think of working with milk paint, but did you know it can produce a strong, smooth, factory-like finish when applied to raw wood? I first used milk paint 7 years ago on the unfinished secretary desk I painted for our entryway. At the time I had consulted with an expert at a specialty woodworking store and he got me hooked on General Finishes Brand milk paints and stains. They’re water based which makes them easy to work with and clean up super easy, and I absolutely love the look and feel of the end result. Our secretary desk gets opened, closed, bumped, banged, and attacked with keys on a daily basis and it still looks as great as the day I finished it. I knew I wanted that same smooth and durable finish for our dresser-turned-sideboard, so I turned to milk paint once again. To get started with my Tarva transformation, I first assembled and then lightly sanded the piece to get it ready for painting and staining. Since I knew I’d be changing out the handles, I also filled in and sanded the preexisting holes on the drawer fronts, and drilled fresh holes for my new handles. 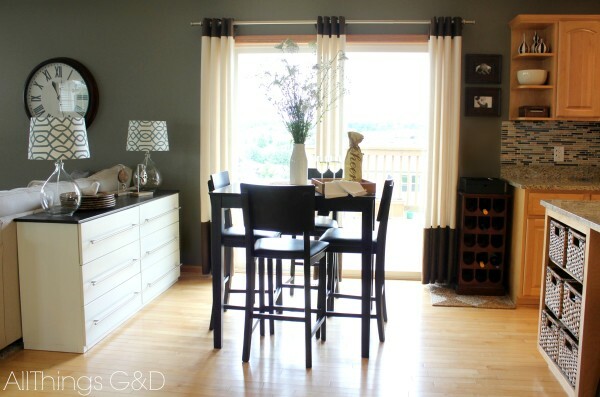 I used General Finishes Milk Paint in Antique White for the lower part of the sideboard. I applied two coats, lightly sanding in between each one, and then finished with two coats of General Finishes High Performance Water Based Top Coat in Satin. This top coat gives the piece an enamel-like finish, leaving it super durable, and the satin finish gives it a slight sheen without being too glossy. It’s my absolute favorite top coat and I use on every furniture piece I paint. For the dark-stained top, I first started with General Finishes Pre-Stain Water Based Wood Conditioner in Natural. I saw firsthand at the Haven Conference last year what a huge difference pre-stain conditioner makes. Pre-stain conditioner allows your stain to go on smooth and evenly, whereas untreated wood is nearly impossible to stain without it looking splotchy and uneven. Once my pre-stain conditioner was set I applied two coats of General Finishes Water Based Wood Stain in Espresso, working in small sections and wiping off excess stain with a dry cloth before moving on to the next session. I finished off the top with four light coats of General Finishes High Performance Water Based Top Coat in Satin for an extra durable, smooth satin finish. I used Antique White Milk Paint for the lower portion of the sideboard, and Espresso Water Based Wood Stain for the top, finishing both sections off with High Performance Water Based Top Coat in Satin. 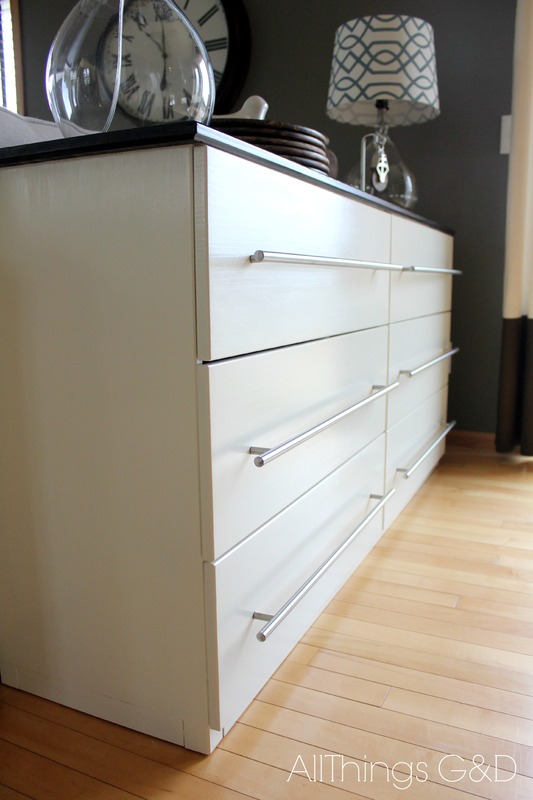 Long stainless steel pulls give the piece more of a “kitchen” look versus a “bedroom” look. The extra storage our new sideboard offers has been a dream come true! It houses Kate’s paints and playdough (things she does at the kitchen table instead of in her carpeted playroom), some of Kate’s activity books, and tablecloths, runners, and placemats for our kitchen table. I keep one drawer reserved for my laptop, planner, blog notes, etc. so I have a convenient nearby spot to house things when it’s time to pack up my “kitchen table office” at the end of the day! I added two glass tear drop lamps with geometric shades on top of the sideboard for some mid-level ambiance lighting, perfect for reading on the couch. I found these two little pulleys on clearance at Target for $5 each, and although they have nothing to do with a kitchen, I absolutely love them. I walked by them probably 20 times, thinking each time I saw them, “Those are so cool!” Once they went to clearance I couldn’t resist bringing them home. I think what I love about them is they remind me of some of the random old things my mom would bring home after a day of “junking” when we were kids. 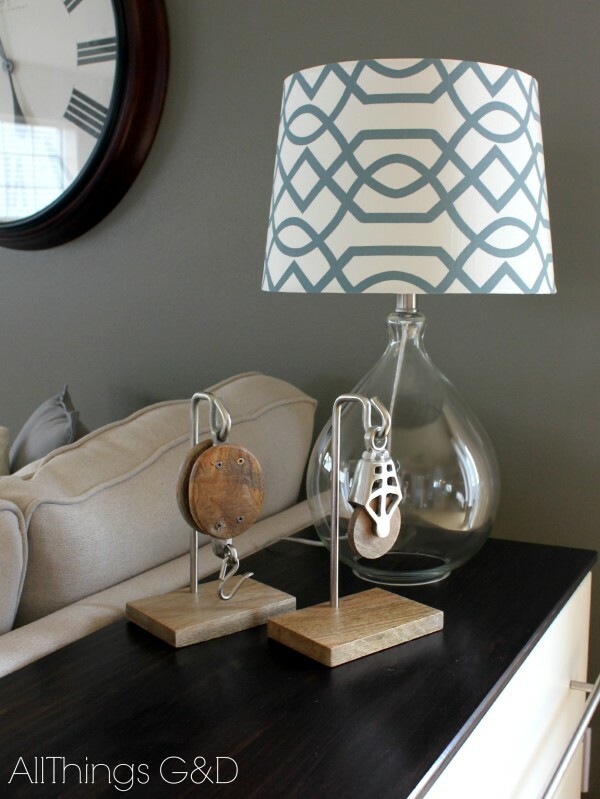 Threshold glass tear drop lamp & geometric shade, and wood and metal pulleys – all from Target. A stack of chargers on the other end of the sideboard keeps them close at hand for meal time. The top of our sideboard, brought to you by Target. Did you notice our new gray wall? This is the wall Kate helped me paint back in March when I decided to embrace a gray kitchen. 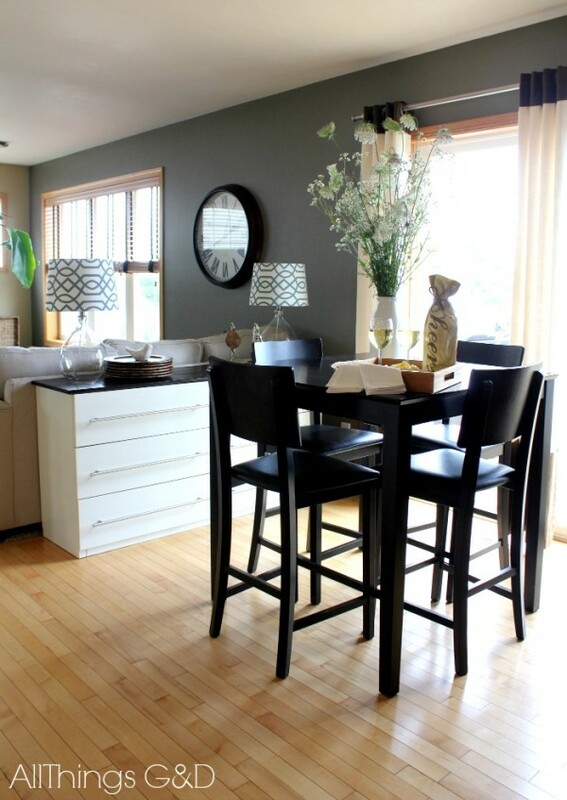 The color is Sherwin Williams’ Anonymous and it looks just as good in our living room as it does in our kitchen! You can kind of see the back corner of the house where the gray meets the wheat color in the living room – I love how the two colors look together! Before: The boring back of our couch, and a colorless wall. 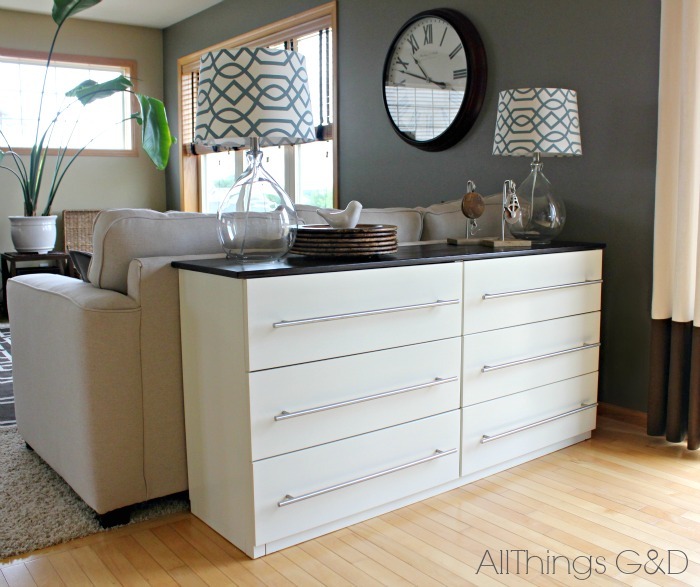 Today: A sideboard, accessories, and warm gray walls! Why yes, that is a dresser in our kitchen. And I love it. So what do you think? 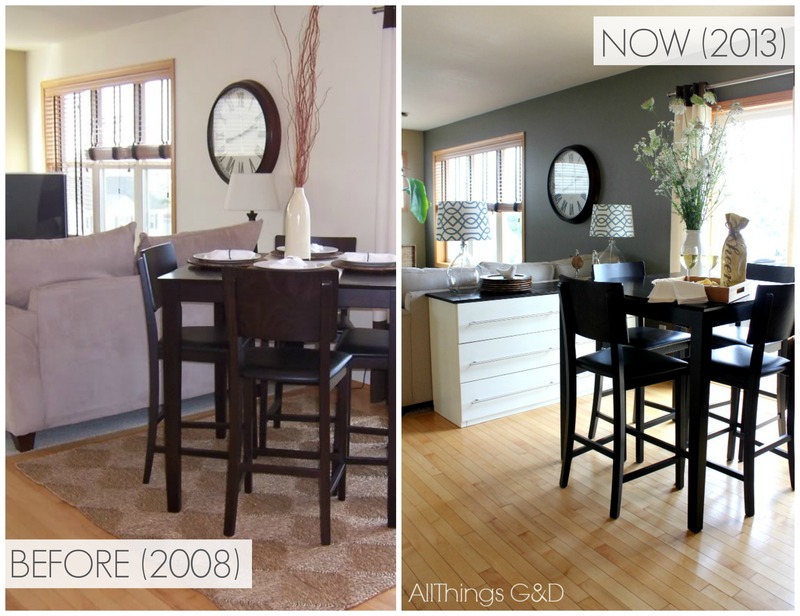 Have I convinced you to try putting a dresser in your kitchen? What other creative storage solutions have you found for your kitchen? Dusty, you animal! This is beautiful! I love when Ikea furniture no longer looks like Ikea furniture, KWIM? Thank you so much, Roo! People are definitely surprised when I tell them its from IKEA. Love it! Love it! I too just bought an old/antique large dresser on at my local clearance at my thrift for $40. I was going to use it to organize some stuff in my bedroom. After dragging in it into my kitchen (it’sa dull naturally distressed red) I absolutely love it as an accent piece. Congrats, looks terrific. PS where did u score the clear lamps? Your new piece sounds amazing, Barb! And you certainly can’t beat $40 – what a find! I found the clear lamps at Target, and the shades were sold separately. Thanks for your comment! I’m so happy to hear it, Desiree! Let me know what you think of it once you take the plunge. I’m really happy with ours. The quality seems great, the drawers pull out beautifully, etc. Great job! Love it and a wonderful idea! Well usually I’d ask you to buy me dinner first, but since you asked so nicely…look for a post coming soon! Love that idea. Playdough + Carpet = recipe for disaster. Or playdough in a potentially unsupervised area (in our case) = dog and child eat playdough for lunch. The dresser looks great! Hi! Totally contemplating doing this for behind our couch! We haven’t had much luck finding thing right size that also has the storage. How tall is it now that your cut off the legs? Love your blog….I’m new to reading it and you always make me laugh! Thank you so much, Laura! To answer your question, the piece is exactly 30″ high with the legs cut off. Good luck in your search! Looks great! My love for IKEA furnitured knows no bounds. 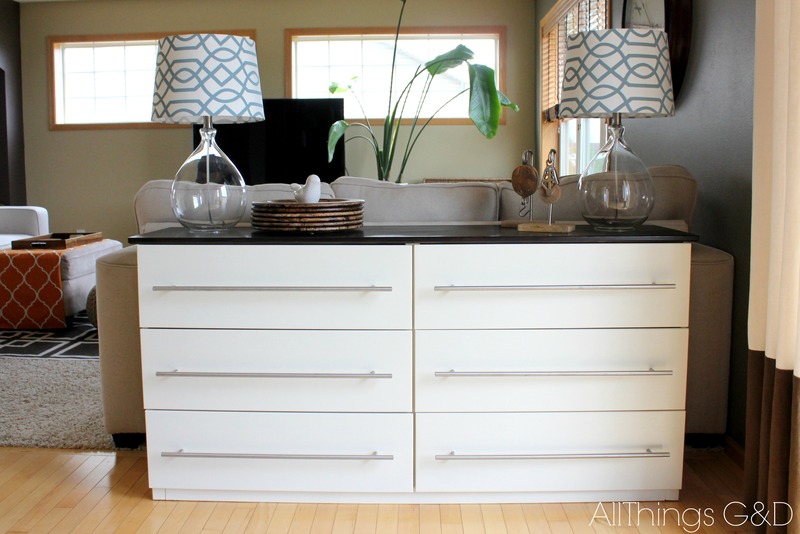 Back in October I did a similar dresser-turned-buffet for my kitchen as well– it’s even black and white too! I noticed that there is a wine cabinet where Chase’s bowls used to be. Do you still have Chase? You haven’t mentioned your four-legged diva in quite some time. Um, hello Genius! What an amazing project from inception to finish. I want to see inside your drawers too…wait, no, not YOUR drawers. ITS drawers. Also, I love the lamps and the new gray paint. Shut the front door! You are brilliant…I need you to come to Waukesha and help me with my new condo. And my place in pewaukee! You’re kitchen/lrlooks so clean and fresh with that gray paint…love it! Love that you’ve been posting more lately! Thank you so much Jill and Kristin! Love you Wisconsin girls representing! Just checked out your link, Bridget – it looks great! We also have a rattan trunk in our LR for Kate’s toys – it works beautiful! Love it and all the bonus storage! Love it! Those handles just make the piece! Thank you so much, Elaine! I agree – the handles were a “must-do” in my opinion to really make it look like a kitchen piece. So glad you like them! I love it! Came here from Centsational Girl & love your blog & style! I’m a newbie blogger, so always looking for great ideas & style like yours!! Thank you so much, Enhance Home Decor! I’m so glad you clicked over and said hello! I’m a first time visitor to your blog.. I came via Kate @centsational girl as she featured your project ..I love it and i’ve pinned it too! Thank you so much, Lesley! Kate (Centsational Girl) is so fantastic. It’s such an honor that she featured my project! Thank you so much for stopping by to say hi! What a great idea. 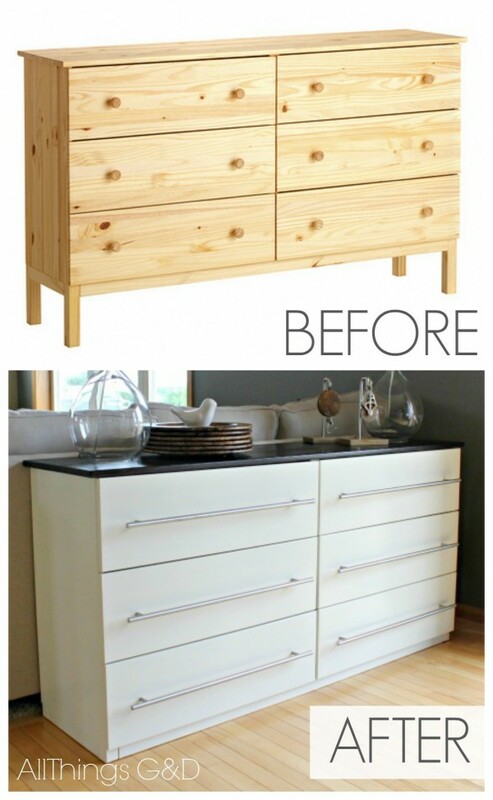 I would have never guessed that used to be a basic ikea dresser. I didn’t realize they sold unfinished pieces. I really like how you stained top and painted bottom. Thank you so much, Pam! I was concerned that a white top would look dingy after a lot of use and abuse, and I didn’t want the entire piece to be dark, so splitting up the finishes was a great solution – I’m glad you like it! I do! We have a carpeted living room and I have a low-pile brown and cream West Elm rug laying on top of it. It looks so cozy for playing on the floor. Thank you for the budget friendly tips. This whole project really came together nicely. 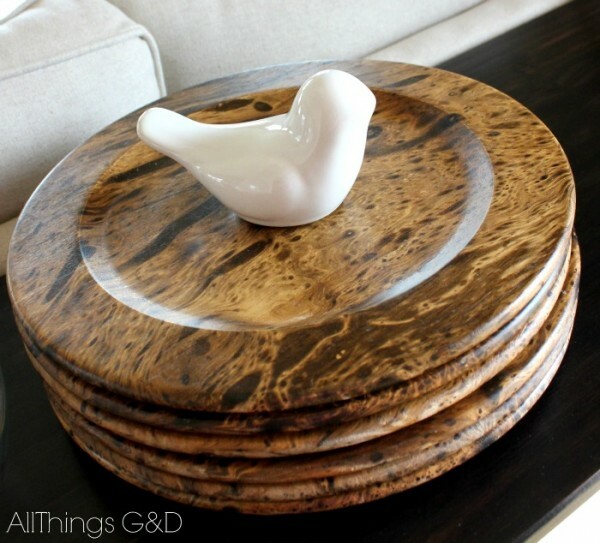 I’m all about the storage too – can never have enough of it – so I love this clever DIY! I LOVE it!!!! Where did you get the lamps? I am looking for something like that for my living room.. Thanks! Thank you, Jennifer! The lamps are from Target. They’re the Threshold brand. Would this also make a good bedroom dresser? I love the look of it. How did you anchor it to the couch? It’s not anchored to the couch; it’s just free standing. Hi there – how high is your sideboard now that you have removed the legs? Also, what tool did you use to remove the legs? Did you put something on the bottom of the entire piece so there is no damage to your floor? Wow! I love this so much, what a beautiful job! I briefly had a dresser in our dining room as a buffet before its services were required as a dresser again. And I dream of replacing a sort-of-random table in our living room with something similar. Hooray for concealed storage! I’ve never understood why it’s call Ikea “hacks”. Ikea WANTS you to do this with their furniture! Beautiful rendition though. Love the handles and the top in that color. What a beautiful sideboard! It doesn’t look like it was ever a dresser. Great job! Thank you so much, Debbie! It was such a fun project to do, and I love how it turned out. Did you paint the inside of the drawers as well? Hi Sean, I left the insides of the drawers unfinished. They look and work out great. 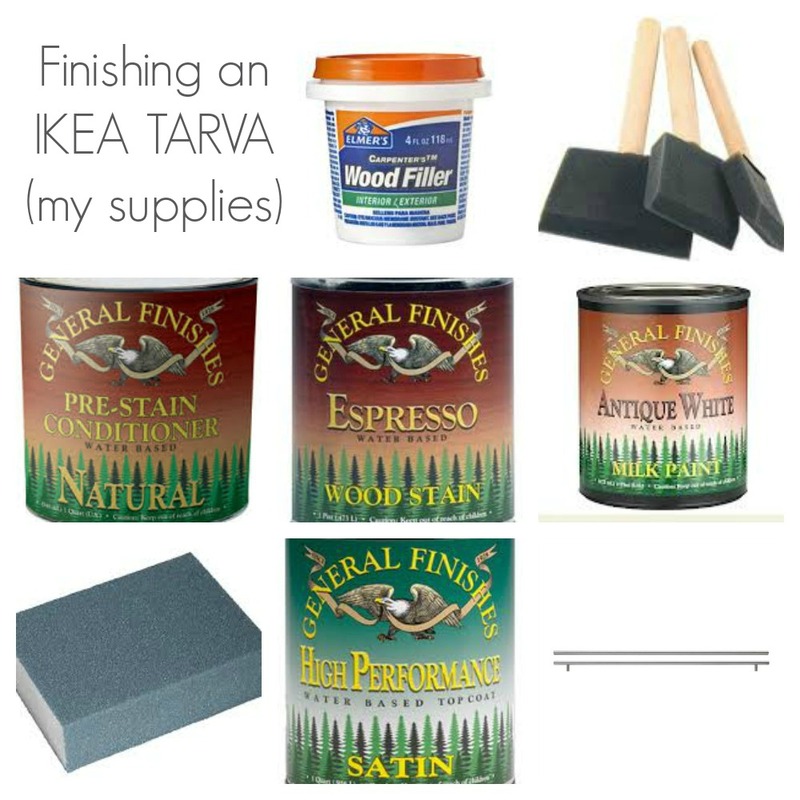 Im looking at buying the Satin Top Coat, how much will I be needing for this project, should I go for the gallon or can I get away with just a quart? Hi Sean – the quart size should be plenty. I don’t recall exactly how much I used for this project, but it was an already opened quart from another project and I still had some leftover. Good luck with your project! Did you just cut the legs off the tarva dresser, or did you do something else to reinforce the skirt on the bottom edge? Yep, I just cut the legs off and did not do anything beyond the assembly instructions for the skirt at the bottom. Hi there. I just stumbled across you blog after Googling the best methods for finishing Ikea Nornas table and bench. Did you apply the pre-stain conditioner to the fronts and sides, or just the top? Hi Jen, thank you so much for visiting! I applied the pre-stain conditioner to all parts of the wood that I stained, so the top and sides of the top part of this piece (everything that’s stained the espresso color). I did not use it on the parts of the dresser that I painted white. Hope that helps! Wow, what a great idea and great execution! 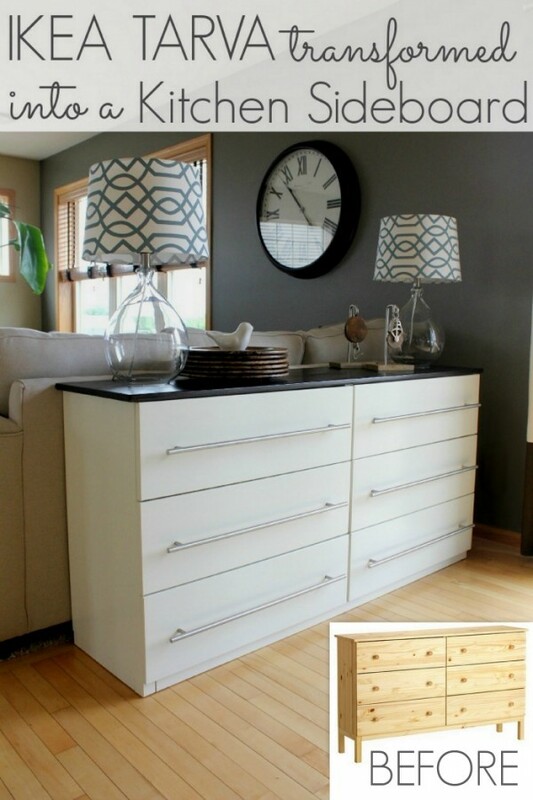 I’ve been thinking about using the Tarva chest of drawers to make ‘built-in’ looking cabinetry but the space I’m envisioning it for is either the perfect width exactly (awesome!) or just a hair too short (dang!). Would it be too much trouble to tell me if the 61″ in width is the width of the box or does that include the width of the top they provide or that you used? I’d like to figure out the exact width of the ‘box’ without the top without driving 45 minutes to ikea. :o) Thanks for any info you can provide and, again, very impressive and inspiring!!! This transformation looks amazing. How did you chop off the legs and make sure it was perfectly straight and even on the bottom? I love this dresser so much. I have a question about where did you get your milk paint at? And also, would you think it would be okay to use a different brand? Thanks for this great blog… I can’t wait to get started on my own projects! Hello Dusty. Very curious to know how the Tarva dresser ages ; 4 years later, are the drawers still sliding well ? I’m thinking to use it in my kitchen to go with Ivar cupboards. Thanks to help me figure out if it is a wise idea ! Hi Caroline – great question! This dresser is still serving us well! The drawers slide beautifully and the finish looks great. Still very happy with this purchase and finishing job!